Thirteen-year-old Ava Bigtree has lived her entire life at Swamplandia!, her family’s island home and gator-wrestling theme park in the Florida Everglades. But when illness fells Ava’s mother, the park’s indomitable headliner, the family is plunged into chaos; her father withdraws, her sister falls in love with a spooky character known as the Dredgeman, and her brilliant big brother, Kiwi, defects to a rival park called The World of Darkness. As Ava sets out on a mission through the magical swamps to save them all, we are drawn into a lush and bravely imagined debut that takes us to the shimmering edge of reality. 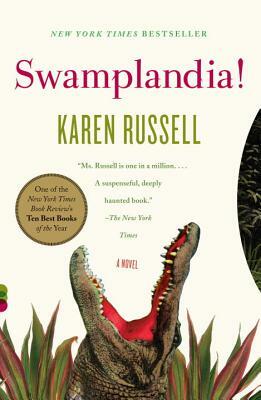 Karen Russell, a native of Miami, won the 2012 National Magazine Award for fiction, and her first novel, Swamplandia! (2011), was a finalist for the Pulitzer Prize. She is a graduate of the Columbia MFA program, a 2011 Guggenheim Fellow, and a 2012 Fellow at the American Academy in Berlin. She lives in Philadelphia.